Wow. This will be the 3rd Open Source Social Networking platform that I blog about today (see the previous 2 posts), and it won’t be the last! 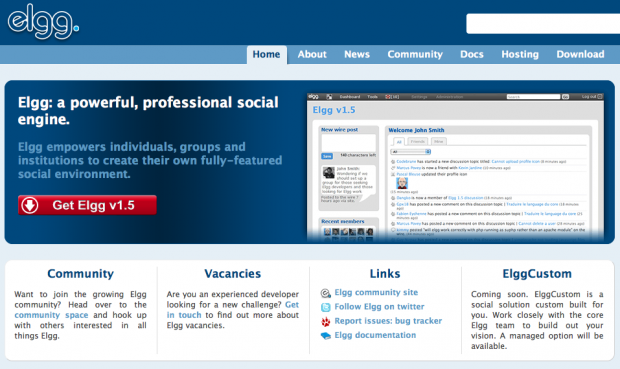 Elgg.org is another great PHP/mySQL-based Open Source Social Networking Platform that may be a good alternative to the many others out there. Completely customizable with a robust feature-list, it’s a pretty mature product that’s been out for a while. Features include Activity Streams, Profiles, Notifications, Groups, Blogs, Media, Files, The Wire, Pages, Social Bookmarking, RSS, Open ID support, Mobile Application Dev, Plugins, Widgets, and more. From my experience, the interface is pretty clean and getting things started wasn’t too hard. It can be a little daunting at first though, but spending some time in the backend will reap a quick return and reward. If you’re willing to wait (and don’t want to roll your own on your own server) they will be offering a service model at Elgg.com (not Elgg.org). I played with elgg a few months back, and it was bitter sweet. It definitely looks fun, but the core navigation was minimal at best. Once you had chased a couple of rabbit trails through network, it wasn't immediately clear how to get back to where you started off the main stream. That and their plugin development platform consisted of a new forum thread for each and every version of each and every plugin. I think elgg has potential, but there is some cleanup that needs to happen to their documentation, plugin development, and core navigational structure before wider application will become practical. Elgg is awesome. Big + is its extensibility. The out of the box navigation is just a taste of what you can do to extend it, and is completely customisable. It does require you to be prepared to not just use it as is unless you want something very generic, but the real strength is in the architecture, and the way in which the api's and data are exposed. For an example of what we did with it, look at http://www.hedgehogs.net. Ken, I appreciate your desire to show the other side of the equation. Your right with http://www.hedgehogs.net, you have accomplished a lot. Ultimately speaking if you hand write a cms in PHP you can do just about anything, and customize anything but thats not the point. On a fresh install of WordPress its fairly intuitive as to how you can navigate the site, and built into the architecture and 99% of the themes out there…..you can always find your way home. And thats at first impression. Like they say in business you never have a second chance to make a first impression. I don't doubt elgg can change, and become more user friendly even for the technologically gifted of those of us out there. On a fresh install of WordPress its fairly intuitive as to how you can navigate the site, and built into the architecture and 99% of the themes out there…..is a way that you can always find your way home. And thats at first impression. Like they say in business you never have a second chance to make a first impression. I don't doubt elgg can change, and become more user friendly even for the technologically gifted of those of us out there.